After the massive response to Prabhas’ Baahubali franchise in the North, the actor’s upcoming film Saaho is highly anticipated. Now, Bhushan Kumar’s T-Series has joined hands with UV Creations, a leading production house in the South, to present the film in the markets up North. Saaho, a trilingual film, is an ultramodern action flick, written and directed by Sujeeth. It will be Prabhas’ next outing on the big screen after the record-shattering Baahubali: The Conclusion. It is being filmed at striking locations in India as well as abroad. The makers are bringing together some of the best filmmaking and creative minds in the business, including Director of Photography Madhie, editor Sreekar Prasad and production designer Sabu Cyril. Since the film will showcase highoctane action sequences, they have also roped in an internationally-renowned action choreographer. Prabhas shared, “Ever since its inception, Saaho has been a larger-than-life story. We want to present our audience with a memorable visual experience.” The teaser of the film, which had released with Baahubali: The Conclusion, gave audiences a glimpse of its futuristic theme and showcased Prabhas in a badass avatar. The film also has an ensemble cast comprising Shraddha Kapoor, Neil Nitin Mukesh, Jackie Shroff, Mandira Bedi, Mahesh Manjrekar and Chunky Pandey. 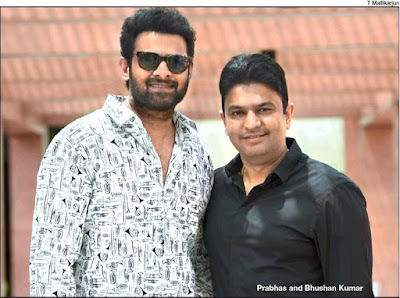 Saaho, presented by Gulshan Kumar’s T-Series and Bhushan Kumar, is a UV Creations production and is produced by Vamsi and Pramod. It will hit screens next year. Saaho to go Mission Impossible, Fast Five way!